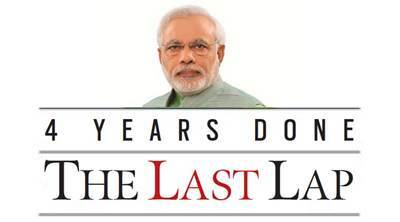 The Last Lap: 118 mobile making units added since May 2014; 5 lakh jobs created in electronics manufacturing so far. The focus of the current NDA government on bringing development to rural areas was a key target area for the digital services sector led by the Ministry of Communications and the Ministry of Electronics and Information Technology. The backbone of Centre’s Digital India programme was the National Optic Fibre Network — rechristened BharatNet in 2015 — which planned broadband connectivity to all 2.5 lakh gram panchayats of the country. The Centre also planned to open common service centres (CSCs) in all 2.5 lakh gram panchayats to offer internet-based government services. Notably, both the optic fibre project and the CSC project had commenced in the previous regime. Further, the measures for reducing the financial stress on the telecom sector were brought in March and debt-ridden telcos are yet to witness any benefits. * Generating IT-based jobs in rural and semi-urban areas was one of the manifesto promises of the BJP as part of its e-governance initiatives. Towards this, 53,300-seat BPO promotion scheme has been implemented at 86 rural BPOs across 27 states. This has employed 12,500 people in small towns such as Imphal, Kohima, Srinagar, Unnao, Guntur, Muzaffarpur, etc. * Using Aadhaar for digital identity-based delivery of services has resulted in the government saving close to Rs 90,000 crore by directly transferring subsidies such as food and cooking gas to over 30 crore beneficiaries. * BJP’s 2014 manifesto called for mandating “digitisation of all government work to reduce corruption and delays”. For this, Government eMarketplace portal was launched as an online market place for procurement by government departments and agencies. As per latest data, over 22,000 buying organisations have placed orders worth over Rs 7,000 crore. * To promote electronic manufacturing, 20 greenfield manufacturing clusters and three common facility centres in brownfield clusters across 15 states have been approved. From two mobile manufacturing units operational in May 2014, the Centre claims there are 120 units making mobile handsets and components now. * The revival of state-run telcos Bharat Sanchar Nigam Ltd (BSNL) and Mahanagar Telephone Nigam Ltd (MTNL) was another key priority. BSNL’s loss fell to Rs 4,786 crore in 2016-17 from Rs 8,234 crore in 2014-15. Its debt nearly halved to Rs 3,813 crore in 2016-17 from Rs 6,385 crore in 2014-15. BSNL’s wireless subscriber base also grew from 91.61 million as of May 2014 to 111.68 million as of March 2018. However, MTNL’s loss has increased from Rs 2,893 crore in 2014-15 to Rs 2,970 crore in 2016-17, as has its debt to Rs 15,160 crore in 2016-17 from Rs 12,070 crore in 2014-15. * While over 1 lakh gram panchayats have been connected with optic fibre under the BharatNet project, it is far behind the initial target of connecting all 2.5 lakh gram panchayats by 2017. Even as the project was revamped and the targets later revised, some villages with the fibre infrastructure are yet to see active internet connectivity. As on May 20, of 1.22 lakh gram panchayats with fibre connectivity, 1.09 lakh had active internet. * The CSC programme, against a target of coverage in 2.5 lakh gram panchayats, has reached close to 1.8 lakh, and the government expects to meet its target by the end of 2018. Currently, CSCs haven’t reached some villages in the Northeast and difficult terrain regions. * In its manifesto, the BJP said it would “put special emphasis on enhancing the connectivity within the (northeastern) region and to the rest of the country”. The telecom department is implementing a project to step up connectivity in the Northeast and has planned an investment of around Rs 15,000 crore – which includes setting up of mobile towers. * The data privacy law, the framework of which is being readied by a panel headed by Justice Srikrishna, is yet to see the light of day. While the panel’s report is expected by June, further stakeholder talks and government deliberations may stretch the timeline to the year’s end. * Notwithstanding the regulatory measures by the Centre and the Telecom Regulatory Authority of India (Trai) to improve the services provided by mobile firms, issues like high rate of call drops remain. Despite regular meetings with telcos to address the concerns, problems such as lack of appropriate number of telecom towers in residential localities and government buildings has not let call quality improve over the years. As per Trai’s independent tests, call drop rates are as high as 27 per cent in some cities for certain operators. * Jobs, in the IT and electronics sector, has been a concern. In one of its first statements, the Centre had informed that the electronics manufacturing had potential for creating 2.8 crore jobs. According to IT ministry estimates as of this month, only 5 lakh jobs have been created. * The telecom sector, grappling with over Rs 7 lakh crore debt, is yet to see the effects of measures put in place by the government earlier this year to reduce the financial stress. Further, as of December 31, 2017, gross NPAs of around Rs 11,000 crore was from the sector, RBI data said.